This Zoom H6 Recorder Podcast Kit with Rode Procaster Microphone from B&H brings the elements necessary to begin recording a 1-person podcast within minutes of opening the box. The Procaster is a broadcast-quality, dynamic microphone that does a great job capturing speakers near the mic, but without picking up unwanted sounds further away. The included Auray two-section broadcast arm makes positioning the mic a snap. The arm's integrated XLR cable plugs right into the H6 recorder, which features high-quality mic preamps and records to an SD card. 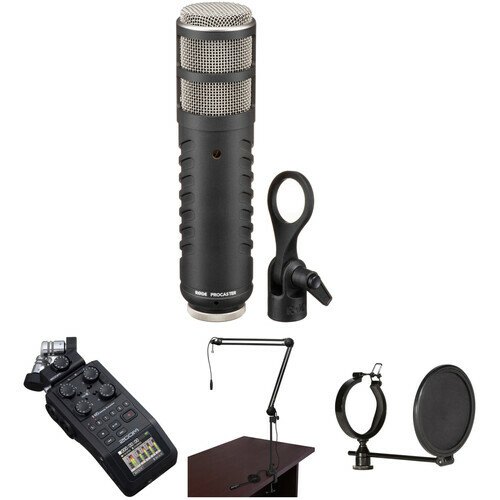 H6 Recorder Podcast Kit with Rode Procaster Microphone is rated 4.8 out of 5 by 285.